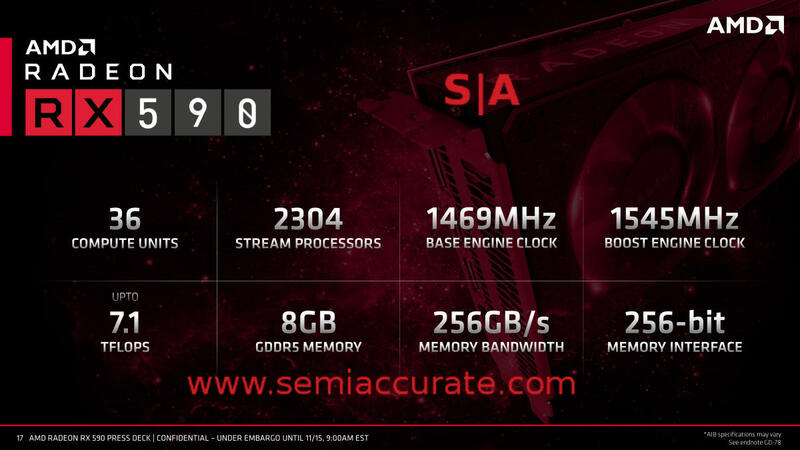 What do you get when you shrink a 14nm AMD Radeon RX580 to 12nm? If you said the new Radeon RX590, well you don’t get any points because SemiAccurate feels this one was too obvious. For both of you that didn’t see this one coming, SURPRISE! For the other few million of you this is the obvious step forward for GPUs. GlobalFoundries’ push-button not-a-shrink 12nm replacement transistor does what it says, replaces the transistors for a claimed 15% boost in clock speeds and 12% performance boost. Other than that it is a standard RX580, the details look like this. AMD is not shy about saying they are targeting the yawning gap in the market from between the 580/1060 and Vega56/1070 with this new part. With a $279 retail price it won’t tempt many current gen RX5xx owners, and the same goes for GeForce 9xx/10xx owners. That said AMD sweetens the deal with three games, Devil May Cry 5, The Division 2, and Resident Evil 2, all of which are equally tempting to the author. Yes that was sarcasm but as we always say, if you were looking at these games anyway, an RX590 might be a decent upgrade. 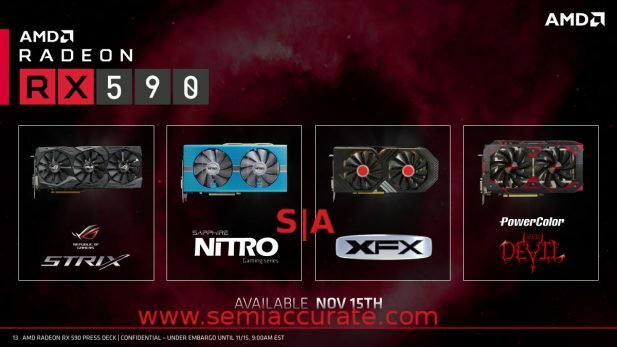 This new GPU is obviously at the high end of the mainstream market and will launch with four cards. All of them are part of their respective vendors’ overclocking/enthusiast lines with no mainstream/vanilla/reference rebadge parts out of the gate. If the picture doesn’t make it obvious you will have devices from Asus/Strix, Sapphire/Nitro, XFX/noniftyname, and Powercolor/Devil.